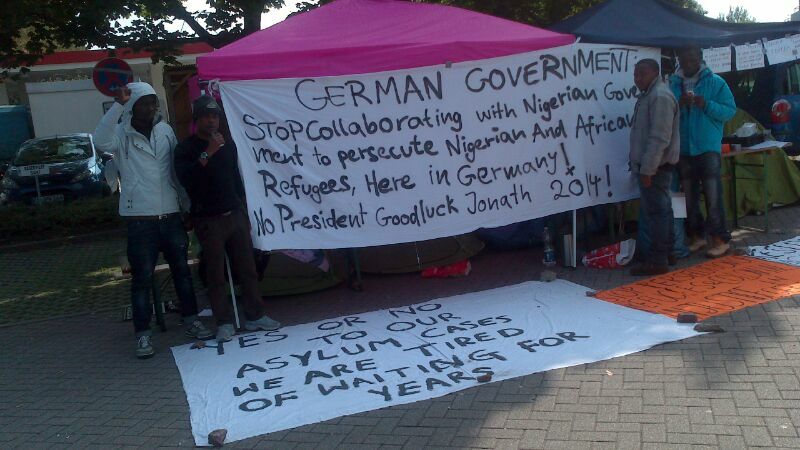 Demonstration in Karlsruhe: Stop the deportation collaboration of Nigeria embassy and the German government! Demonstration on th 28th October 2013, starting at 14 O'Clock in the city of Karlsruhe Protest Camp in front of Refugee Reception Camp - vor der Landesaufnahmestelle in Karlsruhe (Durlacher Allee 100)! To day we, the refugees from the protest tent in Karlsruhe, had a successful kundgebung despite the police interference to provoke us but still we were able to keep them and the situation under our control. Statements were made by the refugees from the protest tent and also from our friends who are supporting us strongly on the street. Finally despite the police aggression we were able to build one more tent adding to the two we have before. As far as they hold our asylum case captive we will take their spaces to reach our goal and the public in general. 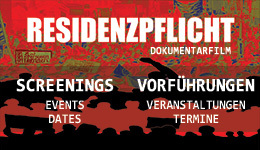 Demo tomorrow, 28th October 2013, starting at 14 O'Clock in the city of Karlsruhe. As they said they start making decision of our asylum cases on Monday 30/9/2013. We will call on every one to support us with a fax campaign. INFORMATION AND STATEMENT ON THE WAY SOON. Since several years now the Nigeria Embassy in Berlin is collaborating with the German Government to deport refugees from Africa to Nigeria. In order to carry out this racist mission the German government move the Nigerian embassy officials from one German city to another on monthly basis from Berlin to Munich, Koblenz, Frankfurt, Dortmund, Düsseldorf, Bielefeld, Köln, e.t.c and also to Karlsruhe, to issue Nigerian travelling documents to the African refugees in order for the German government to practice their racist deportation policies. These refugees are brought before the embassy officials against their will, but forced by the German police using violence and brutality; even some refugees are brought in handcuffs without having committed any crime. Background of this action is that many refugees never had identification documents, some lost theirs on their journey of escape and others because of fear of deportation, as they know that the documents are only needed by the German government for deportation purposes only and not for identification of refugees for right to stay. And deportation is only possible with identity. The German government signed a contract with the Nigerian government under the deportation agency FRONTEX to issue Nigerian travelling certificates randomly to refugees without identification. The real citizenship does not exist, the Nigerian embassy officials are motivated by the money they make from this policy just to suit their wallet and not considering the risk of the refugees if been deported. As a special motivation, the German state pays to the Nigerian embassy officials for each refugee they issue travelling certificate for any refugee to be deported to Nigeria. This inhuman trade with travel documents is racist motivated and needs to be stopped! Refugees activist, Nigerians and non-Nigerians have being protesting this deportation collaboration since years and letters have been written to the presidency under the government of president Goodluck Jonathan but blind eyes and delf ears to the demand of Nigerians abroad. To further protest and expose this racist act which is against human rights, a group of refugees and non-refugees occupied the Nigerian embassy in Berlin in October 2012. We only wanted to bring our demands to stop this racist action of the embassy officials to the public and we were completely peaceful but the Nigerian embassy officials called the German police to arrest us just because we demanded to see and to have an explanation from the Ambassador; the German police stormed the premises of our embassy, beat, arrested and detained us for more than 8 hours. During this process we were threatened by the Nigeria embassy officials and now we are not only facing penalties from the German authorities, but also massive threats by the Nigerian officials. The members of the embassy filmed and photographed the activists and threatened them with death if been deported to Nigeria! We are calling on the responsible authorities responsible for our asylum cases to grant our asylum cases which they have been holding for years now. And we are still on the street with our tent to protest this corrupt act of the Nigeria embassy deportation collaboration. DON’T USE OUR EMBASSY FOR ANY RACIST POLICY. No deportations to Nigeria or elsewhere! Right to stay for everybody! 4. Break all your depoetation prinsons.